Oct 16: Amanda and I slept in late today since we had no hiking to do. Oh, we’d still walk all over town, but not with full packs, and we’d be returning to the same hotel at the end of the day. 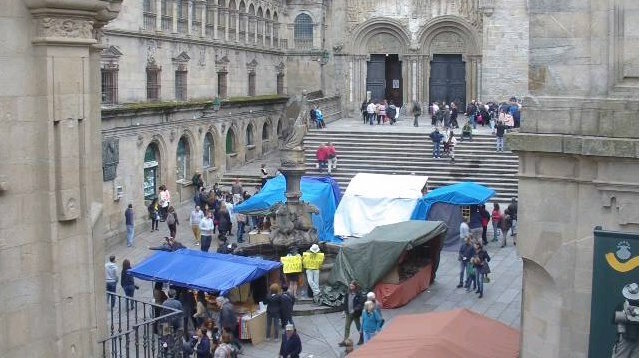 Last time I was in Santiago, I announced when I would be in the main square in front of the cathedral so Wassa could find me on a webcam—live! It worked out well, and we decided to recreate that experience again this year. Given the time zone differences, it would be easier for most of our friends and family if we did it late in the afternoon or early evening, but I set up to do a test run with Karolina, my Polish buddy who happened to be in the same timezone as us. Amanda and I had purchased a large neon-colored paper on which we wrote “Hi, Wilson!” with a Sharpie I carried. Wilson was the name Karolina gave to the pine cone she found (and kept) on the GR 20 the year before. We could have written “Karolina,” but “Wilson” was shorter. And, I figured, she’d find it funnier. We knew we had to make the letters as large as possible and the shorter the word, the bigger the letters could be. We also wanted to make a “Hi, Wassa!” and “Hi, Mom!” sign for our afternoon shenanigans, but I made Amanda hold off for the time being. Let’s see how this first sign worked. Would the letters be large enough? Would Karolina be able to read the text from a webcam? I asked her to grab some screenshots of us so we could check out the images later and adjust as needed. We checked out the webcams for the area and decided that the best option was in the Praza das Paterias. It was the temporary main entrance while the regular main entrance was undergoing renovations, but more importantly, the camera was fairly close to the people in the square. We could be seen better from that camera. We even studied the image looking for the best place we should stand to be visible. We showed up just before the appointed 11:00 time and held up our “Hi, Wilson!” sign with absolutely no idea if Karolina could see us or not. We stuck around for about a half hour, waving the sign around and getting many stares from everyone not sure what we were doing or who this “Wilson” person was. “Webcam!” we’d say, pointing to the camera clearly visible on a second-floor balcony. After a half hour, we figured enough was enough and it was time to head into the cathedral to get our seats for the Pilgrim’s mass. I would have been happy to skip this since I had seen it twice before during my previous visit to Santiago, but it was new for Amanda and watching the giant incense burner swinging through the air at high velocities is a cool thing to watch. The rest of the mass is somewhat boring and conducted almost entirely in Spanish so it didn’t make much sense. But you have to sit through it to get to watch the incense burner. I’m sure that’s no coincidence! Near the end of the mass, the giant incense burner rose and soared through the air, and as soon as mass was over, we headed out to the pilgrim office to officially record our completion of the trail. There was a short line that took the better part of a half hour to get through before we reached the front. And we left with our compostelas. Amanda seemed very happy and proud of her accomplishment wanting me to take photos of her holding her compostela along with a document showing how far she walked—which totaled about 150 miles in all and by far the longest walk she had ever completed. We stopped for a relatively quick lunch at a nearby restaurant—which had a wi-fi connection, so I got online and checked my email to see Karolina’s report on our webcam shenanigans. I had gotten an email from her and she accused us of being about 15 minutes late! Well, perhaps the word “accused” is a little harsh…. She thought that maybe we had been running late or that—maybe—the webcam was on a time delay. We hadn’t showed up on the webcam until about 11:15 just before Karolina was about to give up looking for us. This was good to know, though, because we had arrived about 5 minutes early—at 10:55. The webcam must have a 20 minute delay! That was definitely good to know for our American friends who’d look for us later in the day! We had to either show up 20 minutes early or push back the time to look for us 20 minutes. After lunch, we headed back to the hotel to make additional “Hi, Mom!” and “Hi, Wassa!” signs, and I sent off a message to Wassa telling him that the webcam apparently had a 20-minute time delay so if he didn’t see us on the camera at the appointed time, check back in 20 minutes! We still had a little time before we had to be back at the webcam, though, so we walked down to the train station to purchase tickets. This had the added benefit of giving us a chance to learn exactly how long it would take to walk between the hotel and train station—so we wouldn’t have to leave any earlier than necessary. At the train station, Amanda purchased a ticket for the first train to Madrid the next morning at about 5:00 in the morning. I purchased a ticket for Porto, which would require me to transfer trains in Vigo and would leave about 40 minutes after Amanda’s train left. Then we headed back up to the cathedral for more webcam shenanigans. We each held up one of the signs to the camera and mostly just stood there and chatted with each other. One person walked up to us and asked what a “Wassa” was, which Amanda and I thought was funny. He phrased the question like Wassa was a thing rather than a person. After 20 minutes or so, when we figured we’d been there long enough, we had a mock sword fight with the rolled up signs. And that was really the last thing we had to do for the day. Amanda looked through a few more souvenir shops—she’d been doing this all day long and hit a lot of them, although she showed a remarkable amount of self-control and didn’t buy a lot of stuff even though she would no longer have to carry it on her back long distances each day. The giant incense burner soaring through the air! The line we had to get through to pick up our compostelas kept us busy for awhile! Amanda and I hang out next to the cathedral holding signs that say "Hi Mom!" and "Hi Wasssa!"